A couple of books have been released recently that are related to Florida law and the Florida courts, and I am linking to them in separate posts. AFTER THE ENACTMENT OF SECTION 768.28, FLORIDA STATUTES, AND THE ADOPTION OF FLORIDA SENATE RULE 4.81(6), IS IT CONSTITUTIONALLY PERMISSIBLE FOR THE FLORIDA LEGISLATURE TO LIMIT THE AMOUNT OF ATTORNEYS’ FEES PAID FROM A GUARDIANSHIP TRUST ESTABLISHED BY A LEGISLATIVE CLAIMS BILL? All three members of the panel concurred in the certification order. In Bodzin v. Leviter (4D15-2122), the Fourth District held that the trial court departed from the essential requirements of the law when it entered an order requiring the non-resident defendant "to appear for an independent medical examination in Florida. See Youngblood v. Michaud, 593 So. 2d 568 (Fla. 4th DCA 1992) (independent medical examination of defendant should occur only in county of defendant’s residence)." The majority opinion relied upon the Youngblood case cited above, and held that the "Respondent’s reliance on McKenney v. Airport Rent-A-Car, Inc., 686 So. 2d 771 (Fla. 4th DCA 1997), is misplaced." In McKenney, "the trial court required a plaintiff to appear for an independent medical examination in the county where the plaintiff filed suit, and our court concluded that the trial court did not abuse its discretion." In this case, it was the plaintiff seeking an IME of the defendant, a defendant that was not seeking affirmative relief. Therefore, the court stated that "here, the gravamen of the cause of action in this case─investment fraud─has nothing to do with defendant’s condition. Thus, Youngblood, and not McKenney, is on point." There is no rule or statute which requires the defendant to testify at the trial. See Graber v. Gassman, 321 So. 2d 82, 83 (Fla. 3d DCA 1975). Obviously, petitioner does not intend to testify at trial, and there is nothing in this record to show that respondent has subpoenaed him and intends to call him as a witness. Although petitioner does not object to the examination, he objects to an examination outside of his state of residence. If respondent still wishes to obtain an examination, she must schedule one there. I respectfully disagree with the majority. Florida Rule of Civil Procedure 1.360 does not limit its application to a party seeking affirmative relief. Instead, the rule allows for the examination of a party “when the condition that is the subject of the requested examination is in controversy.” Fla. R. Civ. Proc. 1.360(a)(1) (emphasis added). I disagree that the rule works differently depending on whether it is a plaintiff or defendant being examined. 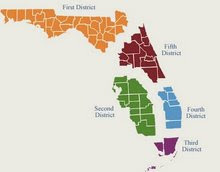 I have found no case law in Florida that holds the rule works differently, depending on which party is being examined.